It’s undeniable that Sheffield is absolutely brimming with creativity! We’re a city that’s famous for making things, from cutlery and steel to public art and web apps. We’ve got independent art galleries, quirky exhibition spaces and design agencies working in almost every corner of the city. The sector is diverse and the opportunities plentiful. No matter which direction your creativity may be taking you, we’ve got a study programme to match. If you’ve got drawing skills and a good grasp of IT then you could be perfect for a graphic design or games design study programme. Maybe your understanding of trends and styles, combined with an eye for individual flair, would make an art and design or fashion study programme more up your street? Our design and arts hub is based at our Hillsborough Campus, and is just a stone’s throw from one of Sheffield’s creative hotspots, Kelham Island. We’ve invested in state-of-the-art design suites, kitted out with the latest Mac computers and design software. We’ve also got workshops where you can explore your creativity and develop your skills in screen printing, metalwork, pottery and more. Our tutors have backgrounds in a variety of creative professions, from graphic design to animation, so all of them have the experience required to offer you the best support and guidance when it comes to careers. Many of them still work in the industry today! All of our design and visual arts tutors are passionate about their specialisms, most of them having worked in their chosen industries for many years, which means they have the experience required to offer you the best support and guidance when it comes to careers. Many of our tutors still work in industry today, so you can be sure that their knowledge is up to date and that they're teaching you the relevant skills that you'll actually need when you enter employment. Plus, these industry connections mean that your tutors will able to advise you on work experience, introduce you to professional contacts and develop your personal working style. We pride ourselves on our fantastic links with local businesses and employers. Our students get the opportunity to work on live design projects set by local businesses to prepare them for the world of work – something employers love to see on your CV. Our tutors can also support you to find a work placement in your chosen career so you can get a taste of what the job is like. You’ll get to showcase your work in our end of year show, visited by design agencies and other local employers – the perfect opportunity to land yourself that job or university place. We’re also keen that you experience as many creative influences as possible so we’re always organising trips for students to experience new things. In the past couple of years alone we’ve taken our students to New York, Iceland and Berlin to name but a few. Hillsborough Campus is our creative hub, housing our custom-built facilities, including Mac design suites, art studios, industry standard games design software and workshops where you can try your hand at screen-printing, metalwork and pottery! No matter what study programme you decide on, we've got the facilities you'll need to develop your skills so that when the time comes to enter the workplace you can jump straight in and feel confident in your abilities. 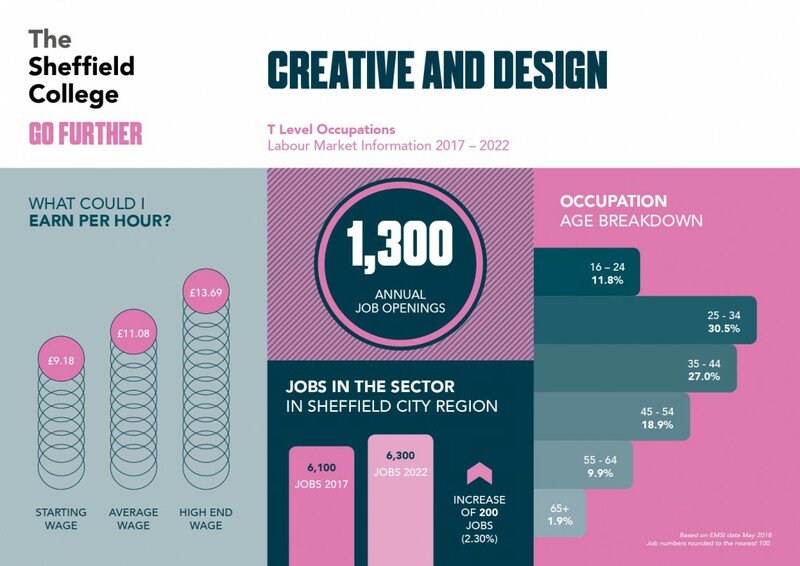 In a creative city such as Sheffield there are numerous job opportunities within the creative and design sectors, with average wages of around £11 per hour. You can use our online toolkit, Career Coach, to find more information about job profiles within the creative industries, earning potential and tips for your CV. "The support I received from my tutors was excellent and I went on to study for my Foundation Degree in Graphic Design at the college too."